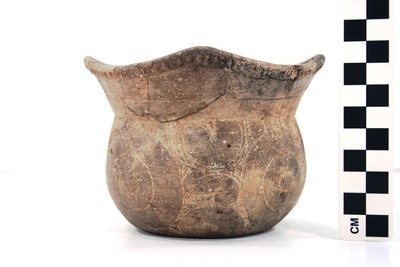 "41UR315, Vessel A 7 SS" by Timothy K. Perttula and Robert Z. Selden Jr.
DECORATION (INCLUDING MOTIF AND ELEMENTS WHEN APPARENT): The rim has two widely-spaced horizontal engraved lines, as well as a row of tool punctations at the top of the rim. The single row of punctations follow the peaks and valleys of the rim. The vessel body has four panels of concentric circles that are divided from each other by large brackets filled with negative ovals, S-shaped elements, concentric semi-circles and hooked arm elements. The central concentric circle element consists of three concentric circles, with the smallest circle at its center. This small circles has pendant triangles. Ripley Engraved, var. unspecified compound bowl, Vessel A 7 SS.